“People jump to the conclusion that this is Donald Trump’s fault – 'Oh, this is Trump all day right? This is about Trump.' Well, I ask the viewer to step back for a moment. You don’t have to look very far and you really don’t have to look too deep to realize that this was here – this was present – long before any politician,” Valdez says. That’s not to say there isn’t a connection to today’s politics. There is a rise in white nationalism in American and in Europe. And according to the Southern Poverty Law Center there is a surge in the growth of white supremacist groups — especially the Ku Klux Klan. 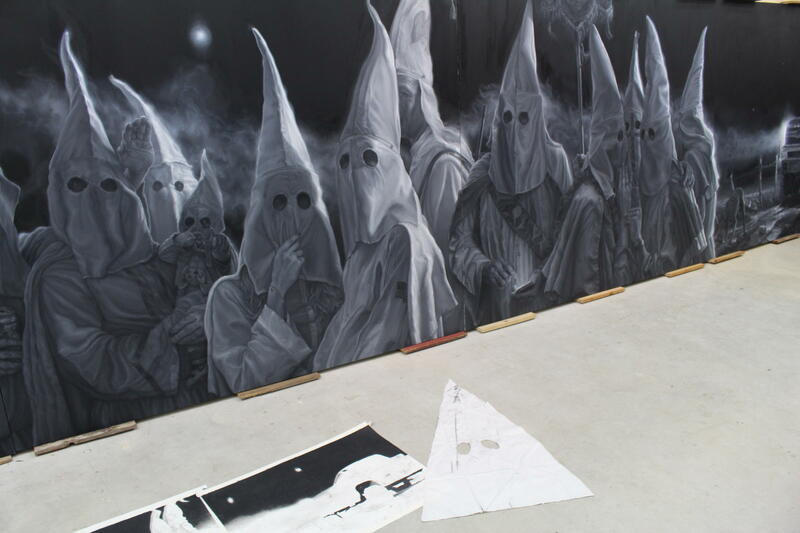 When the painting, in its early stages, was featured in March in the New York Times, Valdez saw how he was touching a nerve in America. “I was flooded with emails,” he said. He says the majority of them were positive, but there were also some threats of violence against him. One email wanted an apology from Valdez in a specific way. “I know that you are the Texas State Artist of the Year and I demand that you wrap up your gold medal and hand it back to Texas Senator Ted Cruz,” it read. 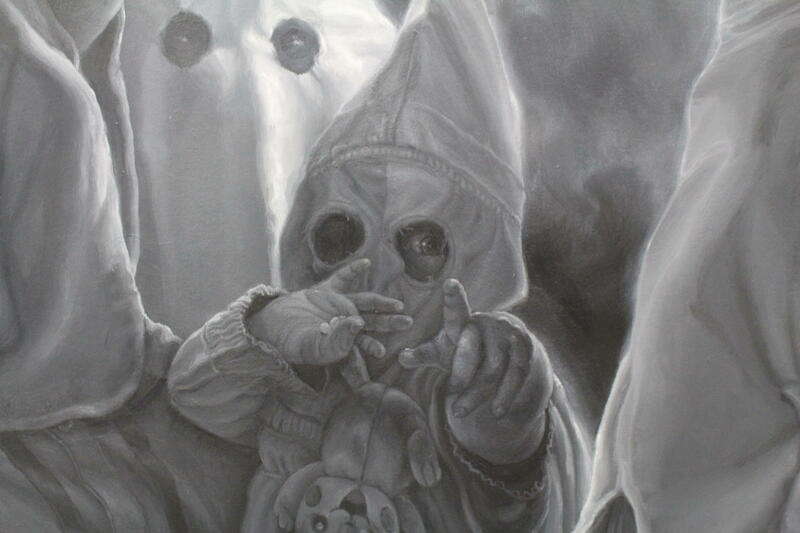 However, Valdez points out that in his painting of the Klan gathering, the members aren’t doing anything that is evil or nefarious. They just stand there, staring into the eyes of the viewer. All but one is hooded. Even the infant being cradled in a mother’s arms in the center of the painting is wearing the iconic robe and pointed hood. But the baby’s cherub-like hands are reaching out to the viewer. On the day of this interview, “The City” was to leave the fire house. Valdez had finished the final touches at 4 a.m. the night before – working the details of the twinkling of the city’s lights. He signed the work. 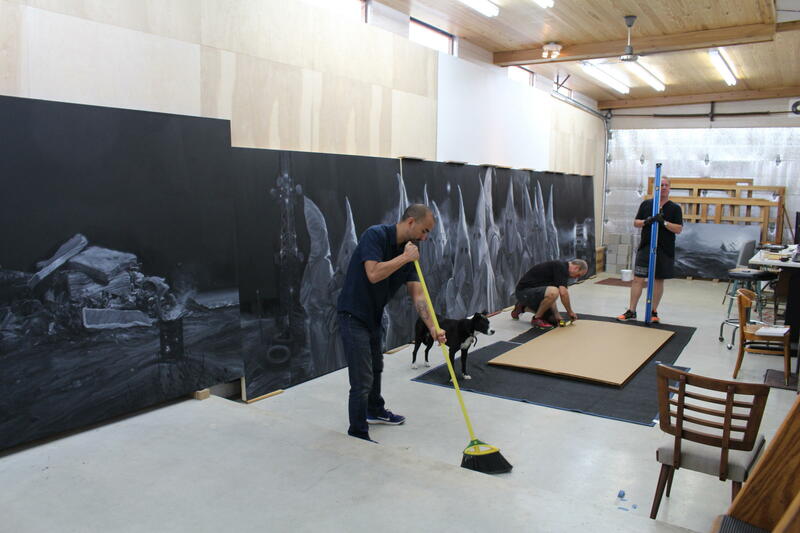 And now the specialty art movers are here to carefully pack up the panels and take them to the David Shelton Gallery in Houston. Valdez says the arrival of these movers reminded him of another work crew that came to his studio and their reaction. They came into the studio and froze staring at the painting. Valdez says that’s what he’s trying to do — get people to talk about race in America. And he said that is the power of art. The work of Vincent Valdez is some of the most recognizable art coming out of San Antonio. His monumental charcoals and paintings have dealt with religion, social justice, and stereotypes around masculinity and ethnicity. Vincent Valdez Artpace Exhibit Bears "Strangest Fruit"
San Antonio artist Vincent Valdez has created an exhibition that, let’s face it, is a little disturbing. But then, maybe art, from time to time, should be. It’s called "Strangest Fruit" and it’s at Artpace. It owes its concept from the Abel Meeropol poem "Strange Fruit," which was penned about seeing lynched black people hanging from trees in the South. Valdez said there's something perhaps even more unsettling than the subject for that poem. 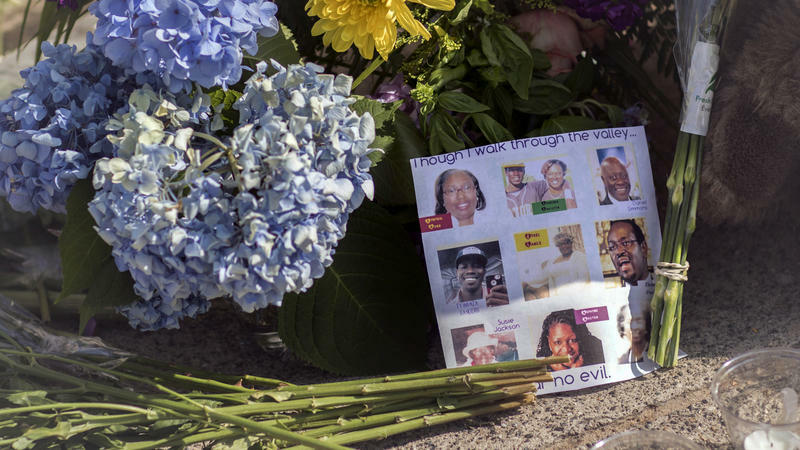 Federal officials are investigating last week's Charleston, S.C. church shooting as a hate crime, and the U.S. Justice Department could weigh in in the coming weeks with a federal hate crimes charge.